An extremely well cared for 39 Sovran, kept in the low salt environment of the upper Chesapeake Bay, "Manifesto" is clean throughout, has consistent maintenance. Low hours (595) on her IPS 500's, she has the joystick control and is well equipped to cruise in comfort. West Florida Yachts would love to guide you through a personal showing of this 39' Tiara 3900 Sovran 2008. 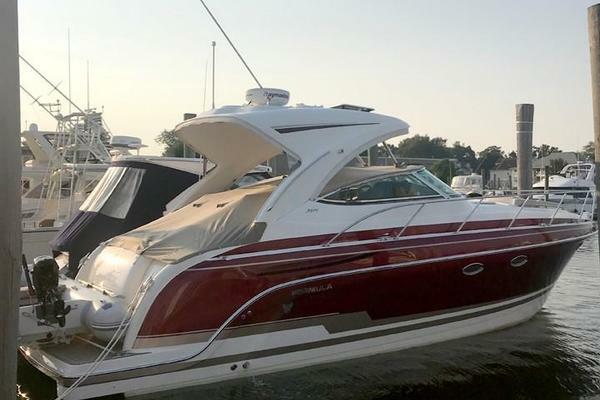 This yacht for sale is located in Stevensville United States and priced at $249,000. For a showing please contact us by filling out the form on this page and we will get back to you shortly! This Sovran continues the Tiara Yachts tradition of quality and engineering that takes full advantage of Volvo IPS technology  including the new IPS joystick control  for superior handling, noise and fume reduction, and fuel efficiency. The full complement of IPS technology delivers 360-degree direction control at your fingertips. By utilizing the space advantages of the IPS drive in a single stateroom layout, Tiara Yachts designers have been able to open up the salon and increase the size of the head, including a full-frame door and stall shower. The extra space is also put to practical use in a step-down theater lounging area. The 3900 Sovran is a uniquely livable single-stateroom floor plan thats ideal for cruising. Its living space is well thought out and fitted out with traditional Tiara Yachts attention to quality, seaworthiness and lasting value. Tiara custom composite hardtop integrated with the windshield. Includes solid side glass enclosures, aft curtain, 1 hatch with built-in Ocean Air® screens and privacy covers, and red and white LED lighting. Aft curtain includes a zippered entryway. Curved companion lounge with table and cup holders • Clarion® AM/FM/CD stereo system with remote, amp, subwoofer, 4 speakers (2 in hardtop and 2 in aft cockpit). Includes Clarion® iPod® interface. Single transom (starboard side) acrylic glass entry door with S.S. hardware. Door opens inboard with safety catch. Media/entertainment system with DVD/CD player, port for games and iPod®/MP3 player. Integrates with flat screen TV in theater room. Lounge seating fore and aft extending length of the room. There is a filler cushion to convert for sleeping, using privacy curtain to enclose. Manually actuated pedestal berth with inner spring mattress and drawer storage below. Includes quilt, 2 pillow shams, and 6 throw pillows. Volvo® digital engine monitoring system (single display) includes fuel level and rudder angle indicators. Separate volt meters for engine and house batteries.